An array can be defined as a sequence of data in memory, wherein all the data are of the same type, and are placed in physically adjacent locations. In mathematics, a subscript is a number written to the right of the variable name, slightly below the line, and usually in small type. The subscript indicates the position of the particular elements. In C++, square brackets are used for this purpose. 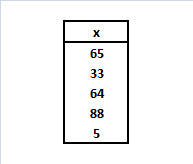 expression is a positive-valued integer expression which indicates the number of array elements. The storage-class is optional; default values are automatic for arrays that are defined within a function or a block, and external for arrays that are defined outside of a function. expression 1, expression 2,..., expression n are positive-valued integer expression that indicates the number of array elements associated with each subscript. Remember that the storage-class is optional; default values are automatic for arrays that are defined within a function or a block, and external for arrays that are defined outside of a function. Also, you can refer the below links to get more details about arrays.